A special SCR Causal Coffee Shop Worship is produced of the show at Community TV Studio on the 3rd Sunday of each month. You may watch the taping as part of the audience as space allows while it is being taped at 5:00 pm. on the third Sundays. Or the show may be viewed as part of the COLLECTION, a footage on various spots as the station chooses. Check the Community TV Schedule. For program listing see http://www.santacruzcommunitytv.com/. Karen Barton produces Reality Church which condenses the coffee shop taping into � hour episodes. This RC program airs at 9:30 am Sunday mornings on Comcast channel 27 and Charter channel 73. Or you can go online at http://www.communitytv.org/ for the realtime showing or 9:30 Sunday mornings. Join us to practice the presence of God together. Each episode features song and dance, testimonies, teaching and prayer. 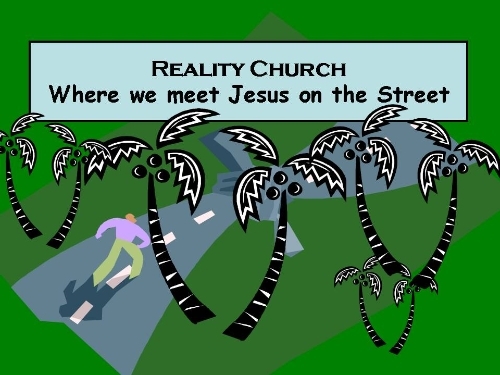 The series Reality Church LIVE is produced by the Santa Cruz Revival pastoral team. This 60 minute series will air LIVE on third Sunday afternoons at 5:00 pm on Comcast channel 27 and Charter channel 73. Reruns of this worship service will air on the other Sundays of the month. We have expanded to other TV stations. Reality Church can be seen on channel 15 of CreaTV in San Jose every Friday evening at 7:30-8:00 pm and on Na Leo O Hawai'i, Inc. channel 54 at 8:00-8:30 am every Sunday morning. Other stations will soon follow as we establish representatives is various communities. If you are interested in our show being aired inyour area, call Karen at 831-254-8590 or write a request on the contact page of this web site. A limited number of persons off the street will be selected guests to attend taping. Just as election TV news feature undecided voters, we will have persons from the street to participate in this section. During street interview, the audience manager will show all participants how to sign the SCR release form which shows agreement to allow pictures of individuals in this film to be aired publicly and to show agreement to proper behavior that would be pleasing to the viewers. The producers reserve the right to air or not to air any portion of the program. After release form is signed and the participant is then escorted into the studio as designated by the audience manager. Up to twenty five chairs will be set up for worshippers and an undecided portion will be identified. Bathrooms are close just outside the studio doors. The worshippers must remain in the audience section for the duration of the program or exit through the rear door of the studio. No booing, hissing or improper interruptions will be tolerated. No food or drinks allowed in the studio and cell phones must be turned off. Worshippers undecided may communicate on how their belief system may have changed as a result of the program. Any participants wanting prayer or further Bible Study opportunities will be directed to that information. The studio will need to be cleared, cleaned and all chairs stacked. The audience must exit the building at the end of the program. All certified SCR staff must put equipment away. <?XML:NAMESPACE PREFIX = O />SCR is an out of the box church plant in downtown <?XML:NAMESPACE PREFIX = ST1 />Santa Cruz with outreaches on the street, in the park, and the Community TV studio. We extend gratitude to the station for allowing us this opportunity with respect for their property and policies. All equipment operators must have current station membership and proper certification.